The artist films a press agency photograph, with its caption. The image is of a sculpture of one of Niobe’s sons dying. The sculpture, still in the Uffizi, is a Roman copy of a Greek original dating from the 4th century BCE. The artist re-examines the myth of Niobe, wife of Amphion, King of Thebes, and mother of seven sons and seven daughters. All fourteen of her children were killed by Diana and Apollo as revenge for their mother Leto, whom Niobe had offended. 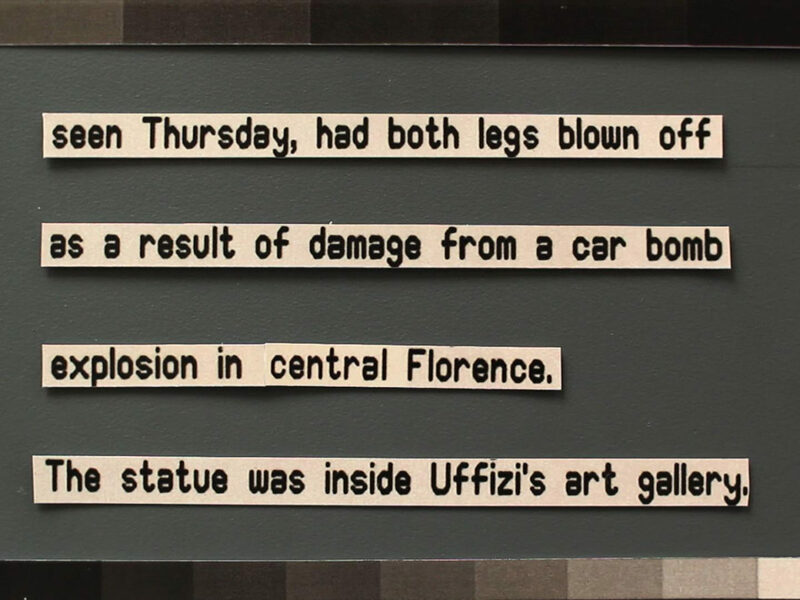 The photograph (and film) shows the statue with its legs broken, the result of the 1993 Mafia car-bombing that claimed several victims and damaged the Uffizi Gallery in Florence.